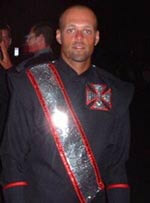 From the Crossmen alumni Web site: Joe Kempf, a member of the Crossmen horn line in 2001, the drum major in 2002, and a member of the Crossmen visual staff since last season, was struck by an automobile while helping another motorist who was stranded on the side of the road last night. He passed away in the early hours of the morning. He was 24. Kempf also was Drum Major of the Reading Buccaneers before joining the Crossmen. ^"Joe was a great DM and a better person," said George Hopkins, executive director of YEA! He was kind, helpful. We were all glad to have him back with the corps in any capacity. Clearly, the death of any young man is a tragedy but somehow, this makes each of us particularly sad, especially, at this time of the year," Hopkins said. The viewing will be held Wednesday, December 22 at the Charles Snyder Funeral Home at 3110 Lititz Pike in Lancaster, Pa. Services will be held Thursday, December 23 at St. John Neumenn Catholic CHurch at 601 E. Delph Road in Lancaster, Pa. Anyone who knew Joe knows that he was always the first man to offer a helping hand. His family has asked that in lieu of flowers, donations be sent directly to the Crossmen. More information about services, etc., will be forthcoming either from the Crossmen Web site or the Crossmen Alumni Association Web site.